Lonicera (honeysuckle) - plant, care, and cultivation. Lonicera (honeysuckle) - varieties, species. Lonicera is a sort of plants from the family of Caprifoliaceae. It contains almost 2 hundred types among which there are lianas (about 25), bushes which are curling, poorly curling and upright, undersized, open and creeping, deciduous, evergreen and semi- deciduous (they semi-evergreen, whose foliage falls down not regularly, and only at adverse weather conditions). The area of wild growth (in the woods, mountains, desert and semi-desertic zones) stretches almost for all Northern hemisphere of Earth. 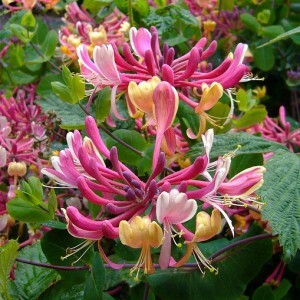 The Himalayas and East Asia are richest with a variety of the Honeysuckle. Gardeners, designers and builders of parks adopted" long ago (mainly for decorative effect) its many types and grades.